Trophy, an exploration of the economics and conservational impact of big game hunting, recently released in theaters, is not easy viewing. This is especially true for those predisposed to having a strong opinion on the subject. Co-directors Shaul Schwarz and Christina Clusiau aim, however, to get a conversation going with conservationists and animal lovers around the world with their film. They hope it may lead to solutions, or at least more concern for and interest in the worldwide challenge of saving thousands of species at risk of going extinct. As a lifelong animal rights and rescue advocate, I had little interest in watching Trophy, but I’m glad I did. I discovered it is possible trophy hunting might be one of the only ways to save a number of species. It may help the world keep ever-diminishing populations of a number of species from disappearing altogether. I spent much of the film enraged at watching the big game hunters, including Texan rancher Philip Glass. He speaks passionately about his kills, and the dream of hunting “the Big Five”, which includes an elephant, rhino, lion, leopard, and buffalo. I’ll stick by my belief that there is no nobility in his or any trophy hunter’s quest. However, there are now hundreds of companies and outfitters in Africa that raise populations of these animals on farms, and sell the right to kill them to the highest bidder. The rarer and closer to extinction a species is, the bigger the price tag to the hunters. Members of this trophy hunting industry claim to be a critical force for protecting and building the population of these endangered animals. The hunts support the local population, who often struggle with encroachment, as in the case shown in the film of a village where a hungry lion repeatedly entered their huts and killed goats that represented their livelihood. The survival of the human and animal population are increasingly at odds. This has led to the expression being coined “if it pays, it stays.” In South Africa, the commodification of endangered animals has led to some populations thriving, but at the cost of some of the biggest, oldest, most majestic creatures being snapped up at auction to be killed as a status symbol. It’s the ultimate good news/bad news scenario. The issue of poaching is also a major problem in keeping a species from extinction. I spoke to Zimbabwean wildlife officer Chris Moore, who is in the film, about working with the local communities to curb the rampant poaching going on there. He said there are literally no rhinos left in his territory. They’ve all been killed. In nearby South Africa, there were 13 rhinos poached in 2007, but by 2014 there were 1215. He said he is a reluctant convert that legal trophy hunting could make the difference for both survival of local communities and survival of animal populations. 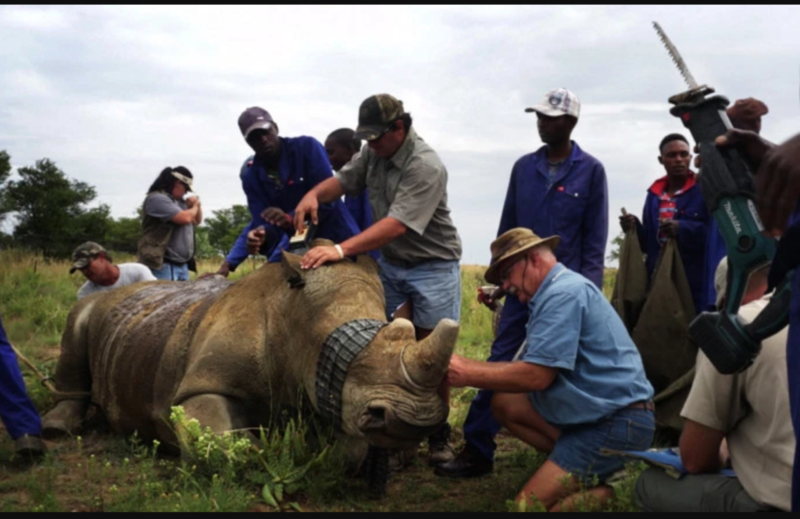 As to rhinos, there’s a man profiled in Trophy named John Hume, who is the world’s largest private rhino breeder, with a ranch that is home to over 1500 rhinos in South Africa. He has used his entire real estate fortune into raising and protecting these animals. He advocates trimming the rhinos’ horns every few years, because it keeps them from being killed by poachers. He is fighting to lift the 2009 moratorium on the sale of rhino horns, because he has a huge stockpile from trimming the horns of his own population, and the sale would allow him to keep his rhinos safe and continue breeding. Conservationists argue it will just empower the dangerous poachers, who are armed to the teeth, and killing not only rhinos, but the people who get in their way. Hume wants to teach communities how to trim the horns of their own rhino populations, so the poachers have no access to their horns. The film goes through interviews with the various perspectives, and follows those profiled in their experiences. We watch Hume supervise a rhino having his horn removed. We also watch him get very emotional about his animals and their protection. Emotions also get the better of Philip Glass, as he shoots and kills the lion he’s bought the right to hunt. It’s unclear why he’s crying, although it appears it’s relief and pride. Christo Gomes, owner of Mabula Pro Safaris, which is a one-stop-shop for hunting, lodging, and safari experiences, is shown auctioning to his clients in the US, a country with one of the highest number of trophy hunters in the world. What makes the film work so well is Schwarz and Clusiau’s ability to maintain both objectivity and sensitivity in their filming and interviews. The fact that they are both photojournalists clearly gives them an advantage with the subjects. The landscape and environments are beautiful, even as the events unfolding may be difficult to watch. There are some complicated issues happening in our world that can’t and shouldn’t be ignored. It behooves those of us with curiosity, a conscience, and a desire to find solutions to pay attention. The documentary Trophy asks us to consider one such issue, and as such is worth a little discomfort.